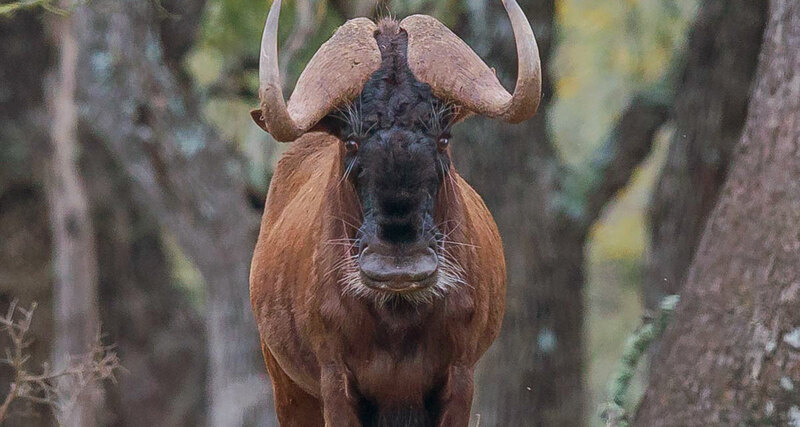 Where it lives alongside the blue wildebeest, the two species can hybridise, and this is regarded as a potential threat to the maintenance of the species. The black wildebeest was once very numerous and was present in southern Africa in vast herds but by the end of the nineteenth century, it had nearly been hunted to extinction and fewer than 600 animals remained. A small number of individuals was still present in game reserves and at zoos and it is from these that the population was rescued. There are now believed to be more than 18,000 individuals, 7,000 of which are in Namibia, outside its natural range, and where it is farmed. Around 80% of the wildebeest occur in private areas, while the other 20% are con ned in protected areas. The population is now trending upward (particularly on private land) and for this reason the International Union for Conservation of Nature (IUCN), in its Red List of Threatened Species, rates the black wildebeest as being of “Least Concern”. Its introduction into Namibia has been a success and numbers have increased substantially there from 150 in 1982 to 7,000 in 1992.